Tasty different take on a Chicken Burger Last Night. I used to make this with Pork Mince when I wasn’t on plan so I decided to lighten it up with Chicken. Now it’s near impossible to get Chicken Mince anywhere near where I live but it would be very worthwhile getting you’re lovely friendly Butcher to mince the Chicken for you, it would leave it lighter. I was standing in the middle of Aldis so just picked up a pack of their fillets & threw them in the food processor, granted they were slightly denser than intended but still gorgeous all the same so go with the Chicken mince if you can get your hands on it. Regarding the Curry Paste, it’s the Paste you want not a Sauce, Paste is used as a base for Sauce and is much more condensed, concentrated & flavoursome. Peel your Butternut squash (I know they’re a bugger to peel! 😂) and chop into chip shapes. Spray well with sprayoil and bake in a preheated oven at 220c for approx 35mins or until browning & cooked through. Meanwhile Blitz your bread into breadcrumbs in your food processor & set aside. Lightly blitz the Chicken Fillets until they are smooth, combine in a bowl with the breadcrumbs and the rest of the Burger ingredients & mix well but lightly with your hands. You might want to wear latex gloves it’s a bit messy! Shape into 4 equal sized burgers. Fry in a hot pan sprayed with sprayoil for around 10 mins each side or until fully cooked through (you might want to roll them around on their sides a bit when cooked to seal the edges) Be sure they’re well cooked by cutting into one slightly and checking the middle. 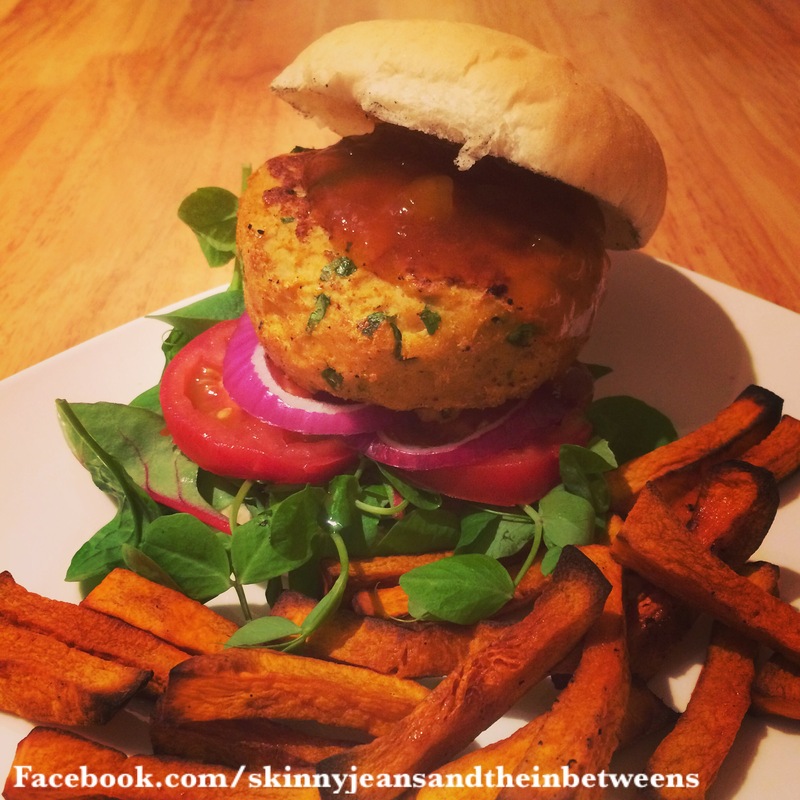 Serve on the Bun with the Peashoot salad, Red Onion, Plum Tomatoe & Mango Chutney alongside your Butternut squash Fries & Enjoy! Serves 4 at 9 propoints a serving or just 3pp on F&H.